Metro weekend work is resuming now that inauguration and Women's March on Washington are behind us. On the Orange and Blue lines, the Foggy Bottom and Farragut West stations will be closed for maintenance from 7 a.m. Saturday though closing Sunday. Orange and Blue line trains will operate in two segments: between Vienna and Rosslyn every 15 minutes, and between McPherson Square and New Carrollton every 15 minutes. 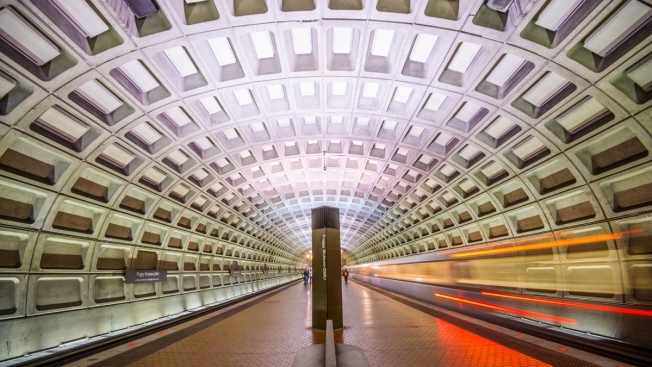 Buses will replace trains between Rosslyn and McPherson Square. Riders should tap their SmarTrip cards each time they exit and re-enter the system, but won't be charged extra, according to Metro's website. "Riders traveling through the work zone will be charged for a single, continuous trip," Metro said. The Silver Line will run only between Wiehle-Reston East and Ballston this weekend. Riders should transfer to the Orange or Blue lines to complete their trips. Silver line trains will run every 15 minutes. On the Red Line, trains will be single-tracking between Medical Center and Grosvenor from 10 p.m. Friday through closing Sunday. Red Line trains will run only every 18 minutes, with the following exception: They'll run every 9-10 minutes between Farragut North and Silver Spring from 9 a.m. to 9 p.m.
On the Yellow and Green lines, trains will single-track between Mt. Vernon Square and U Street from 8 p.m. to closing on both Friday and Saturday nights. This scheduled work will not effect Friday's March for Life rally. Metro has previously said they plan to run extra trains on Friday during midday service.